Google has introduced an experimental search tool called Google Hotel Finder that allows users to quickly find the best hotel for their money in any given location. Google’s experimental hotel search engine joins the ranks of other well known travel and hotel search sites like Kayak, Expedia, Travelocity, and Hotel.com. The only difference being that Google has the ability to integrate paid listings into the search results. Google can charge, say Best Western, a certain amount of money per click for their hotel deals appearing in the top search results for any given metro area. Google faces a tough road ahead with a service like Google Hotel Finder. Already, the search engine giant faces antitrust allegations that Google discriminates against other competitors in their search results when they enter a new marketspace. However, Google has always contended that the search results are all natural and their algorithm is never altered to favor one site over another. 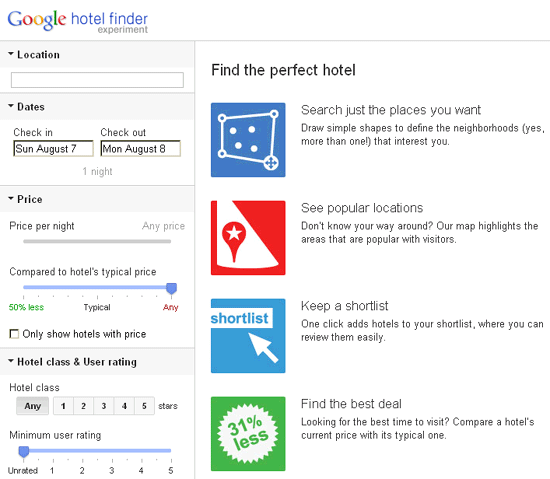 Google Hotel Finder is a powerful addition to Google’s already growing fleet of products and services. Google has recently launched Google Offers, a service that is designed to compete with the likes of Groupon and Living Social in the daily deals marketspace.